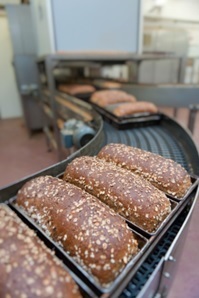 July 01, 2013 - "Applications "
American Urethane is pleased to announce it has begun a production order for 23,000 polyurethane conveyor rollers for an industrial bakery client. After creating 300 conveyor roller prototypes for testing and evaluation, the client placed the production order to replace all of its existing rubber rollers which wear out frequently and interrupt production runs. The new polyurethane conveyor rollers have three times the service life of rubber rollers and are easy to clean. In addition, these polyurethane rollers are FDA compliant for food production usage. The long service life of these polyurethane conveyor rollers will create faster production runs, reduced production line downtime and cost savings. Does Your Facility Need Reliable and Long Lasting Production Line Components? American Urethane creates custom urethane / polyurethane parts at low tooling costs for industry, government, military and related organizations. All of these polyurethane components are designed to exacting standards. Each client project always begins with rapidly built prototypes created at low cost for evaluation and testing. Components can be manufactured for both short and long term product runs. Polyurethane component parts are used because they are superior to other materials such as plastic, rubber and steel. Molded polyurethane parts offer long run durability that function long after rubber and plastic parts have failed. Cast polyurethane parts can be made iron-strong or sponge-soft, in any color or shape. In addition, polyurethane components offer extreme resistance to harsh environments of water, heat, solvents, chemicals and abrasion. Learn More About Polyurethane Parts & Components, Please visit the American Urethane Website.